Before I Leave You – Goat anyone? This story is cross-posted with North Shore Art Throb. I’ve heard more than one person suggest that Salem is the new Cambridge. Though we may not have as many world-class universities our cultural life is pretty vibrant and often just as insular. So much so, that it’s easy to forget there’s more to see and do and enrich just a train ride away. The Huntington Theatre Company, one of our country’s most adventurous, is staging a new play by the 72-year-old Cambridge playwright and Huntington Playwrighting Fellow Rosanna Yamagiwa Alfaro, Before I Leave You. 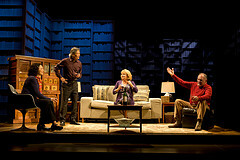 In this love story for grownups–which the playwright suggests was inspired by taking a tumble with a paella pan–three staid and stereotypical Cantabridgians of a certain age along with a flashy unemployed visiting realtor sister from Nashua struggle to find room for passion amidst the rituals and relationships they’ve developed over decades of shared living. Regular dinners at the Royal East provide comfort and boredom; marriage offers security, but not freedom. Eventually, Koji, the petulant professor of Elizabethan theatre, will connect with his Asian roots as he disconnects from his crunchy artist wife of 40 years, Emily. The physically ailing, novelist Jeremy wonders what it means that he’s lost five percent of his brain mass and what it would be like to have Emily as his wife. With a cast of professors and a stage stacked floor to ceiling with books, it’s a talky play; relatively short scenes rotate among the Royal East, and the living rooms of Jeremy, and Koji and Emily, contributing to a sort of jerky pacing. A less-skilled, or at least less enthusiastic, cast will struggle to keep the energy up. Once everyone settles in here, though, Alfaro’s dry and biting wit inspires non-stop chuckles. Often her punchlines turn on racism–alive and well even amongst the enlightened Cambridge set–and occasionally so nuanced that it takes a collective couple beats for the audience to catch up. Alfaro has created a very strong sense of place, which as a day-tripper sitting in the Huntington’s South End Calderwood Pavillion is a bit disorienting. I kept catching myself making book browsing and turkish coffee plans–inspired by Harvard Square life–though the wine bars and design shops of the South End were actually in my future. One might argue that a trip to Before I Leave You is like visiting both neighborhoods in half the time. If Salem is in fact the new Cambridge, I got to thinking what might a group of stereotypical Salemites look like in thirty years. Are we developing rituals and neuroses today, that tomorrow will become prisons out of which we feel we must break free? Evenings: Tues. – Thurs. at 7:30pm; Fri. – Sat. at 8pm; Select Sun. at 7pm. Matiness: Select Wed., Sat., Sun. at 2pm.